For the second Comms Creative newsletter Q&A, we have the most creative person I know. She’s a badass friend of mine who constantly fuels my imagination: Philippa Davies. Philippa is a writing coach, best-selling writer and psychologist keen on community engagement. She’s written for tv, radio, created apps, built and written websites, and published 13 books. ‘Irresistibility’ became a best seller after The Times serialised it, and ‘The Gritties’ got made into a double Wales BAFTA award-winning film. 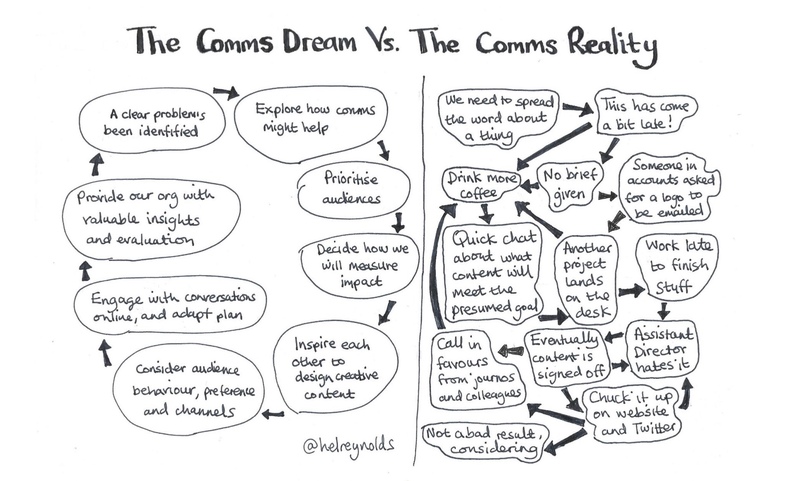 I blog the Comms Creative Q&As here every month – but if you want to be the first to read them, as well as loads more creative comms jazz, sign up to the newsletter. I’m Philippa Davies, smallholder; psychologist and writer; not-really-a-comms-person so also, impostor. Not sure, but I am unattractively nosy, like to experiment and love to play around with software. Indeed, I find activity like animation incredibly relaxing. My view is that most comms is community building. David Byrne, because he is out there and constantly experimenting. OMG me too! I’ve loved him for ages and then heard him on Desert Island Discs and was more obsessed. OK, so what is the piece of creative work you’ve seen that you wish you’d done, or that you’d like to see more of in comms? I would like to have written ‘Should’ve gone to Specsavers’. A single line of genius. ‘Only connect’ is good, as is ‘Get over yourself’. Recharge your messages by turning them into cartoons, poems, soundscapes, impressionist paintings and invented dishes. Ask: if this message was a meal component, what would it be? (Beware too much mashed potato). Become oddly fanatical. I am quite uncomfortable writing here as have taken a vow to only communicate via video. Next time, Helen, please offer me this option. Haha, OK. What projects are you working on right now? Yes, you’ve sensed right: I experience non-stop twitching!